If you live down south, you are lucky enough to already be enjoying warm, sunny days. If you are further north like us, the weather has not yet warmed sufficiently to be spending days at the beach. However, since the season is short, we New Englanders embrace each and every beach day we get. There is an excitement in the air with the promise of warm days to come, and we cannot wait to start stocking our closets with beach totes, sundresses, and new swimsuits to welcome the season in style. Beach bag: Classic canvas that coordinates with everything trimmed in luxurious leather for a pop of color: choose Ink Skylark, Creamsicle Skylark, or Keylime Skylark. Sunglasses: When it comes to sunglasses, our mantra is the bigger the better. Look chic while shielding your eyes, and don’t forget the sunblock! Reading material: Is there anything more relaxing than curling up with a good book or glossy magazine while the waves roll in? We say no. Scarf: Our large scarves are oh-so versatile – wrap one around yourself to wear as a sarong over your swimsuit or wear over your shoulders when the sun goes in. Beach Towel: Necessary for sunbathing and post-swim drying. 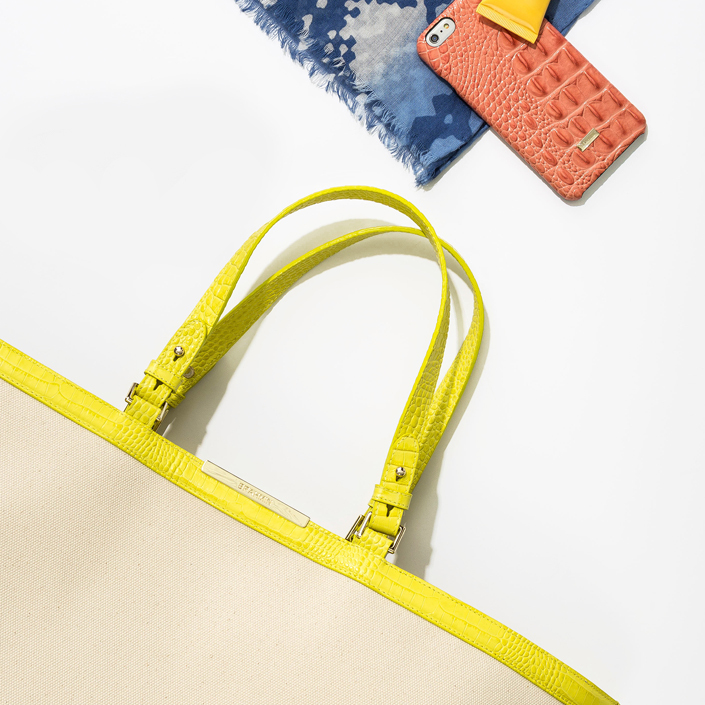 Bonus points if your towel matches your beach tote! Posted on April 4, 2016 by Brahmin Handbags.